Hello everyone! I believe I have said this before, but I am going to say it again – the classics are classic for a reason. Usually for some familiar comfort we are seeking, but also because of their taste. Meatloaf is one that has been done, overdone, and redone. It’s actually worked its way back to trendy in the past few years. And for good reason – it may not be the first thought that comes to our minds when we think gourmet, but it can be just that! 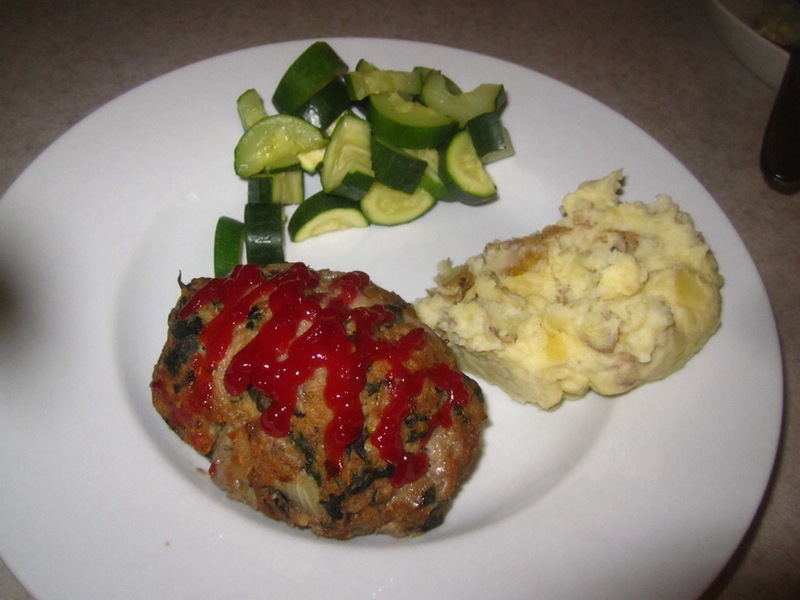 Meatloaf is one of those things that really can have a million variations. Pick one thing to change – the meat, the fillers, etc.– and you could have a version of meatloaf you’ve never had before that you want to eat again and again. I love meatloaf for a few reasons. Cost is definitely one. Because the meat is ground up, it is usually a less expensive cut. All of the other ingredients combined probably cost less than $1. Another great aspect is the minimal effort – never underestimate my laziness! This is a great make-ahead dish too. Freeze it and use it when you want it. Since my dinners are for 3 (2 adults & one quickly-growing kid) I can usually split this recipe amount into 2 dinners. I will make 4 individual loaves that I bake the night of, and then put I the rest into a loaf pan or small casserole dish (in large loaf form), seal tightly and freeze. And there you go – 2 meals for the price of one! This particular recipe is one of my daughter’s favorites and, I must admit, one of mine too. My mom wasn’t really into cooking (she was too busy keeping a roof over our heads – major props to my mom! 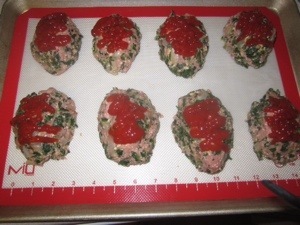 ), but meatloaf was one of my favorite things that she made. I am using a couple of her tricks here to honor her. I have other recipes for meatloaf, so you may see another one or two later on, but this is my go-to recipe. In fact I’ve made it so much that this recipe is the first time I actually brought it out of my head and put it on paper! This is also a great recipe to get kids involved in. There are a couple of steps that even smaller kids can do while you attend to the more difficult things. And who says dinner is a one man/woman job anyways? Get that family in the kitchen and put them to work! It’s one of my favorite ways to spend time with my daughter – especially when she pretends the veggies I am chopping are alive and screams what she thinks they’d be saying. Goofball. Your everyday oil is just fine. The eggs work as a binding agent to keep everything together. If you don’t eat eggs for some reason then I would double the “milk” we add in and add a couple of tablespoons of flour. Whatever milk or plain milk substitute you have around is fine. This is going to add moisture to the loaf and a little richness. This is my mom’s trick. She never used breadcrumbs for her filling, she used oatmeal, and it was delicious! It adds wonderful starchiness to the dish as well as giving us a break from all that wheat we eat. You can use any type of oats as long as they are plain. In fact, I used a couple of the individual plain instant packets last time and it worked like a charm. This is one of the few times I use ketchup. I love it though. It adds a little vinegary tang. It’s also a classic topping for meatloaf. And it has a purpose besides tasting good – it keeps the loaf moist inside as it bakes. If you don’t always preheat your oven, please try it. Your cooking will improve greatly. When a recipe says bake at “said temperature” they mean the entire time, not put it in the oven and the first ten minutes wait for it to come up to the right temp. In a skillet, warm the oil over medium to medium high heat. Peel and chop up the onion and toss in the pan. Sprinkle with salt and pepper. Let the onions become translucent (about 5 minutes) before turning the heat up ever so slightly. Let cook another 5 minutes, stirring often, until onions start to caramelize. Who wants to bite into a delicious meatloaf only to find huge chunks of half-raw onion? Not me. Onions serve as flavoring and aromatics in this dish. We are sweating them first (the translucent part) then letting them caramelize (which basically means bring out their natural sugars, which equals more flavor). Chop and toss in garlic. Stir for 1 minute. Turn off the heat and set aside. If you are using fresh greens instead of frozen add them in at this point with a pinch of salt until they wilt. In a large mixing bowl, add eggs, cinnamon, pinch of salt & pepper, oatmeal, milk, and about 2 tablespoons of the ketchup. With a fork, whisk them all together. Mixing all these things together before mixing them into the meat will help us keep our meat tender. Ever had a meatloaf that’s texture resembled a hockey puck? It was probably because it was over-mixed. Also, this ensures we have everything evenly distributed. Put defrosted spinach into a colander and place in your kitchen sink. One handful at a time, squeeze the excess water out of the spinach and place in the mixing bowl. Defrosted spinach has a HUGE amount of water in it. It needs to be squeezed out. This is one step I wouldn’t recommend skipping. Kids love doing it, so set them up at the sink and let them go! Add the onions and garlic to the mixture as well. Then add the turkey meat. Sprinkle a heavy pinch of salt on top of the turkey. Using your bare hands (don’t forget to wash first! ), gently mix everything together until all ingredients are incorporated. Get everything fully mixed. Don’t stress on what I said earlier on the hockey puck meatloaf. Relax – this is the therapeutic part of the job! It may be messy but it’s so fun! Just stop mixing once it’s all distributed. From this point you can either make individual loaves or one big loaf (to be sliced after baking) on a large baking sheet. I can usually get about 8 good sized loaves out of this amount. Freeze half if you’d like, or make it all for meatloaf sandwiches the next couple days. Oh yeahhhhh. Squirt the remaining ketchup on the top of the loaf/loaves, like a glaze or frosting. Remember we’re sealing that moisture in the meatloaf with this step. And since turkey doesnt have much fat, this step is necessary. Bake at 425 degrees for 30 minutes (individuals), 40 minutes (big loaf). Thanks so much for visiting me this week! I hope you try this and/or any of my recipes. And if mine don’t work for you then find something that does. Just try to do what you can. It’s pretty hard to completely change overnight. If you are just starting out, take baby steps – eventually you will get there. Try just cooking one time a week and increase as you go. And I am always here, happy to help answer any questions you have. Recipes coming up soon – chocolate-avocado smoothies, kale & cannellini ravioli, macaroni and cheese, lamb chops w/ chimichurri…..lots of freezer-friendly meals! Thank you for reading my recipe! I will also include a printable version of this recipe without all my witty repartee (ha-ha!). I hope you enjoyed it enough to try it! If you have questions or comments, leave a comment on the post and I will happily answer it. For more of my recipes and delightful commentary please check out my blog BradyMunch on Word Press! Much love & light to you all! See you on the flip side!